At the end of Latham Island you arrive in N'Dilo, a Dene First Nation Aboriginal community near Yellowknife. When the gold prospectors arrived, the Dene who lived in the Yellowknife area resided on Latham Island. Many years ago, before the white man came into this country, a special man with extraordinary powers named Yamoria was sent by the Creator to travel across the Dene lands. He put everything into its rightful place. The animals and human beings were separated from each other. Whatever was harmful to people was gotten rid of. By doing this, he had set laws for our people to follow. Until this very day, we are still holding onto them. This story had come about when there were large beavers living in Great Bear Lake (Sahtu). The beavers were harmful to the people living in this area. People that lived in this area would travel across the lake by canoe to hunt the caribou. The beavers did not like them to travel across the lake so they would get as close as possible and splash their tails hoping to tip the canoes over. In this way they would be getting rid of the people. After this the men no longer wanted to cross the lake by canoe to hunt. They faced starvation. So they sent a message to Yamoria. When Yamoria heard about that, he went to Bear Lake and told the people that he would be chasing the beavers away. Yamoria started chasing the beavers around the lake. The big beavers immediately went down to Bear River. The younger ones were harder to chase towards the river. During the time that Yamoria was chasing the younger ones around the lake, the bigger beavers had built a dam on the river and that’s where the Bear River rapids are to this very day. Yamoria got the younger ones to head down to Bear River and then chased them all down the river to where Tulita is now situated. At the confluence of the two rivers, Bear River and Dehcho (Mackenzie River), he killed two medium beavers and one small one. The larger ones continued down the Great Dehcho River, and built dams that created the rapids. After killing the three beavers, he stretched and nailed the three hides on the south face of Bear Rock Mountain. You can still see them to this very day on the face of the mountain. This spot is a sacred place for the Dene people. While he was doing that – the two larger beavers that continued on down the Great River (Dehcho) had built two more rapids. %u2028After he had finished with those beavers that he had killed at Tulita, he then continued on chasing the other two larger beavers down the Great River (Dehcho). From the top of Bear Rock Mountain, he shot two arrows at the confluence of the two rivers and he said, “As long as this earth shall last you shall call them Yamoria’s arrows.” Still to this day, you can see two big poles sticking out of the river. Even after each spring when the ice goes there always are two big poles sticking out of the river. After shooting the two arrows into the river he brought the beavers that he shot with him up the Great River (Dehcho) about 20 miles from the confluence. There he slept. Where he had cooked the beavers, the grease that drizzled from the beavers started to burn, and to this day the fire continues to burn, warming and comforting the Dene communities. It is even said that when walking in this area at night, those destined to live a long and prosperous life can still see the fire burning and hear it crackling. According to the Elders, the rapids in Denendeh territory, the symbol of the three beaver pelts on Bear Rock Mountain, the poles in the river and the forever-burning fire up river from that mountain are signs of the land set there as a reminder of the teachings of the legends. They say that if we remember the teachings of the legends and live by them, if we take the sign set on the land for us as our symbol, we will never have any trouble surviving as a nation. On the tip of Latham Island you cross into N’Dilo, an Aboriginal community and home to the Yellowknives Dene First Nation. The N’Dilo community numbers approximately 500 residents. Many traditions are still practised, and many inhabitants speak T%u0142%u0131%u0328ch%u01EB (Tlicho), one of the Dene languages. 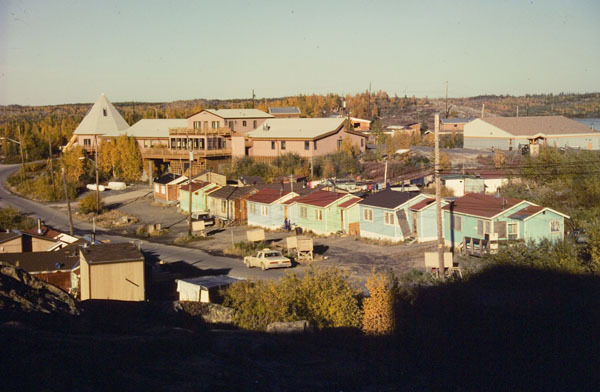 Detah, located south of Yellowknife, is another Yellowknives Dene community. The Dene were the first people to settle in the Northwest Territories. Some archaeologists believe that the Dene nation dates back some 7000 years, back to the end of the last ice age period! They also believe that the Dene’s traditional oral stories that are filled with giant animals in fact refer to the animals that actually existed during this era but which disappeared with the global warming following the ice age. In the Northwest Territories, 48% of the population are Aboriginal peoples. Of these, 28% are Dene. Demographically, the Dene is the largest Aboriginal group in the NWT. The Dene are divided into 4 groups: Slavey, Tlicho, Sahtu and Chipewyan. These communities speak different languages that all come from the Northern Athabascan languages. The Dene call the land they occupy ‘Denendeh’ which means the land of the people. Traditionally, the Dene were a nomadic people who lived in the boreal forest. Their lives followed the rhythm of the seasons and the migration of the animals. They would travel following the herds of animals and the availability of plants they depended on for survival. They would travel on foot, or along the waterways in canoes built from birch bark or caribou skin. Building a canoe was a community effort. The Dene had to be very ingenious and adaptable to have survived in such a difficult climate – 6 months of winter a year that brought extreme cold. The first contact with the Europeans took place at the start of the 20th century. This eventually led to profound social changes within the Dene communities. For example, fur trading had a major impact on the Dene’s traditional lifestyle and on their economy. As with many other Aboriginal communities, the elders play a major social role. They are sought out for their knowledge about the collective memory and understanding of the land. Through their stories, the elders relate the history of the Dene, their traditional lifestyle and the stories and legends that they learned through oral tradition, passed down through generations. They are responsible for teaching the children everything they need to know in order to survive on the land and pass down their culture. Still today, they are highly respected and consulted on many occasions: during discussions on the future of the community, during cultural activities with children and youth, when advice is needed on the traditional use of the land, or during community healing sessions. Consensus has traditionally been the political model of the Dene. Moreover, the present-day Government of the Northwest Territories has adopted this unique process of functioning.